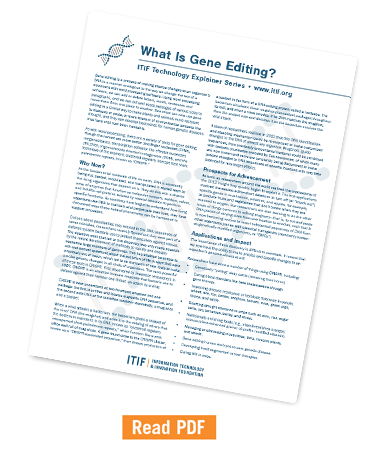 ITIF Technology Explainer: What Is Gene Editing? Gene editing is a process of making precise changes to an organism’s DNA in a manner analogous to the way we change the text of a document with word processing software. Gene editing is a process of making precise changes to an organism’s DNA in a manner analogous to the way we change the text of a document with word processing software. Using word processing software, we can add or delete letters, words, sentences and paragraphs, and we can cut and paste passages of various sizes to move them from one place to another. Scientists can now use gene editing in a similar way to make plants and animals more resistant to diseases or pests, or more tolerant of environmental stresses like drought, and they can develop treatments for human genetic diseases that have until now been incurable. As the fundamental molecule of life on earth, DNA is constantly being cut, pasted, modulated, and manipulated in myriad ways by the living organisms that depend on it. They do this with a diverse array of enzymes that function as molecular scissors, welders, valves, and forklifts—all proteins tailored by natural selection to perform specific functions. As scientists have begun to understand how living organisms use DNA to maintain and perpetuate their lives, they have discovered ways these natural phenomena can be harnessed to support innovation. Curious about peculiarities they noticed in the DNA sequences of some microbes, researchers recently figured out they were part of a defense system bacteria use to protect themselves against viruses. The detective work that led to this discovery was only made possible by the recent development of methods to rapidly and cheaply sequence large numbers of genomes. This has enabled scientists to ask and answer questions about the evolution of life in ways that were previously out of reach, which led to an explosion of new tools to make precise genetic changes in all kinds of organisms. The most powerful of these tools is CRISPR. First discovered by Japanese researchers in 1987, CRISPR is an adaptive immune response that bacteria use to defend against their number one threat: an attack by a virus. CRISPR is best understood as two functions wrapped into one package: the first identifies and locates a specific DNA sequence, and the second cuts DNA at the identified location—essentially, a mug shot and a scalpel. When a virus attacks a bacterium, the bacterium grabs a snippet of the virus’ DNA (the mugshot) and adds it to the catalog of others that the bacterium maintains in its DNA, known as “clustered regularly interspersed short palindromic repeats,” which function like a post office wall full of mug shots. A gene found close to the CRISPR cluster, known as a “CRISPR-associated sequence,” then directs production of a scalpel in the form of a DNA-cutting protein called a nuclease. The bacterium circulates these mugshot-plus-scalpel packages throughout its cell, and when a virus invades, if its DNA matches the mugshot, then the scalpel cuts and destroys it so the bacterium survives the viral attack. A team of researchers realized in 2012 that this DNA identification and disabling mechanism could be re-purposed to make customized changes to the DNA of almost any organism. Mugshots (guide sequences, from previously encountered bacteria) could be combined with scalpels (nucleases encoded by Cas sequences, of which many are now known and more are constantly being discovered) to make precise changes to DNA sequences at specific locations with very little potential for non-target effects. As soon as researchers around the world realized the implications of the 2012 insight they quickly began to exploit it. The first applications involved the easiest edits—short deletions to turn off (or “knock out”) specific genes in mushrooms, potatoes, and apples, for example, to produce fruits and vegetables that don’t brown when they are exposed to oxygen. But researchers are also learning to do the other kinds of things common to editing programs—that is, to cut and paste DNA pieces of varying sizes from one location to another, such that it is now becoming routine to insert substantial sequences of DNA from other organisms just as with classical transgenics (commonly known as genetically modified organisms, or “GMOs”). The importance of this discovery is difficult to overstate. It means that we now have the ability to make precise and specific changes to an organism’s genome almost at will. Genetically “polling” dairy cattle (removing their horns). Curing blood disorders like beta thalassaemia throughgene therapy. Improving disease resistance or herbicide tolerance in canola,wheat, rice, soy, potato, sorghum, tomato, mice, goats, pigs, sheep, and cattle. Boosting drought tolerance in crops such as corn, rice, sugarcane, soy, tomatoes, barley, and wheat. Nutritionally enriching foods (e.g., vitamin-enriched oranges; micronutrient-enhanced grains; oil-profile modified oilseeds). Managing or eliminating mosquitoes, ticks, invasive plants,and weeds. Gene editing human embryos to cure genetic disease. Developing T-cell augmented cancer therapies. The hope is that in the future gene editing will allow researchers to develop genetic solutions to a vast array of diseases and pests that farmers face today with no easy solutions, and treat or cure some of the most complicated diseases that humans face with no cures to date. There are two major applications of these new gene-editing techniques: biomedicine and agriculture. In medical applications, the principal policy challenges revolve around the safe and ethical design of clinical trials without overly burdensome regulation that would block vitally needed therapies without necessarily improving outcomes. Almost daily announcements of new discoveries and insights make a compelling case for continued support for basic research by NIH and other agencies. The major policy challenge with respect to agricultural applications is similar, but even more stark. Safety concerns are far less than with human medical applications—for example, there is no moral imperative to “do no harm” to a tomato or an ear of corn. And while consideration of potential negative environmental or safety consequences is important, all indications are that the products of gene editing are and will continue to be at least as safe as those derived from older breeding methods, while experience has shown that the opportunity costs of undue regulatory caution based on hypothetical concerns are significant. These issues can be easily resolved by a return to the foundational principles of U.S. regulatory policy for biotechnology products since 1986: The objective of regulation is to protect against unreasonable risk, not to ensure there is zero risk. The severity of regulation must be proportional to the degree of risk being managed or mitigated. In the case of gene editing, there is no indication of any novel risks associated with the products or techniques involved, which negates any argument for special legislation or new regulatory approaches. Some fearful skeptics have called for special labels on products produced with gene-editing techniques. But inasmuch as genetic engineering and gene editing are processes, and not ingredients—and their use says nothing about the health, safety, or nutritional value of resulting products—then special labeling for GM products is unwarranted and should be set aside. L. Val Giddings, “Gene Editing, GMOs, and Fear Based Marketing” (ITIF, June 2018). Jennifer Doudna, “How CRISPR Lets Us Edit Our DNA” (TED Talk, September 2015). Heidi Ledford, “CRISPR, the Disruptor” (Nature 522, 20-24, June 2015). Megan Molteni, “The Wired Guide to CRISPR” (Wired, April 2018). Steven Kotler, “The Human Operating System Gets an Overhaul” (Neo.Life, February 2018). Agnes E. Ricroch, “Assessment of GE Food Safety Using ‘-omics’ Techniques and Long-term Animal Feeding Studies” (New Biotechnology, Volume 30, Issue 4, May 2013). Gene Editing and GMOs - the Same or Different?